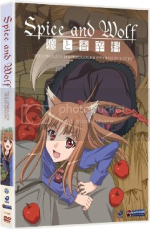 Set in a fictionalized old European world, Spice and Wolf tells the story of Holo, a pagan wolf goddess who has helped a small village harvest a plentiful wheat crop year after year. But the townsfolk started to get tired of the goddess and accuse her of slacking off, so she escapes from the fields and stows away on the cart of a traveling merchant named Lawrence. Upon discovering the fox girl sleeping buck naked in his cart, Lawrence offers her a job as his partner in trade. The two begin traveling from village to village peddling goods. Holo keeps her identity hidden from others while Lawrence teaches her his craft. All the while they must deal with rival merchants, currency conversions, dangerous animals, and that blasted Christian church! I think it’s safe to say that the hype around Spice and Wolf has been pretty big lately, especially since Yen Press just released the light novel this series was based off of. But after seeing all 13 episodes of the first anime series, I really found it hard to see what all the hype has been about. I was very impressed with the way this story dove deep into mythology. In fact, I thought it was a very biting commentary on the Japanese taking on Western religion, which is a topic we rarely see anime approach in this way. After all, the series’ protagonist is an animal goddess in a world dominated by the monotheistic Christianity. And they sure don’t paint Christianity in a positive light either, often portraying the church as corrupt and eager to persecute the pagans as devilish witches. But along with that strong mythology, you also have a story fronted by two lovable characters in a very intriguing relationship. The banter and constant teasing between Holo and Lawrence portrays the ultimate “madly in love with each other but too proud to admit it” situation you often see in stories. The plot thickens when Nora, a cute blond shepherd girl, enters the picture and Holo obviously becomes jealous at her. This ends up becoming the most interesting aspect of the story. I also have to give FUNimation kudos for providing another great English adaptation to a series set in old European culture. The scriptwriter often diverges from the Japanese dialogue to create a tone to the story that feels authentic to the type of folklore we’re used to hearing in English. While the dialogue is not nearly as poetic as it was for the Romeo x Juliet dub, it most certainly has a style to it that is worth listening to. But even with all these high marks for the series, the ultimate problem with Spice and Wolf is that it gets boring. In this dialogue-intensive series, very little actually happens. There are probably three or four story arcs that spread thinly across the 13 episodes, and each new major plot development is hardly exciting and easily forgettable. Instead, we spend about 80% of the entire show watching the two leads slowly traveling across the countryside and talking, talking, talking to each other. And what are they babbling on about? Fake economics for a fictionalized old European world. They talk about the purity of coins, the conversion of currencies between different villages, negotiating prices among merchants, buying on credit, the fact that one gold piece can be broken down into 35 silver pieces, blah blah blah. Unless you’re the type of person who gets a kick out of filling out your tax returns every year, I really don’t know how this dry conversation is exciting. Also, I never really get upset over anime theme songs, but this ending theme song just completely rubbed me the wrong way. It is a simple childish nursery rhyme about apples sang in English by someone who, obviously, can’t speak English. On top of this, it also contains the line, “with seven seeds to plant inside of me.” I think that they’re talking about apple seeds, but it obviously invokes a far different vision for English speakers than it was intended to. It is Engrish at its worst, and it’s annoying at every level. The Good: Interesting mythology, lovable characters, and a good English adaptation. The Bad: Pacing is too slow and boring, ending theme song is annoying, and fictional economic babble runs pretty dry. Final Verdict: Don’t believe the hype. Spice and Wolf is far from being as great as everyone makes it out to be. But amid all that boring drivel, there is enough there that makes the show worth checking out in the long run. Watch it. This entry was posted on Monday, December 21st, 2009 at 2:17 pm by Scott	.